When asking people to pray for my run, I asked them to pray for me to "run humble". Running is my baby. My strongest leg. I KNEW once I got the run injury free, I would be fine. Starting off with E was a real boost for my morale too. 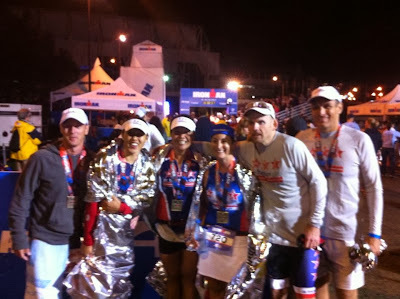 We chatted away about the race so far, how we felt and how we were going to be Ironmen in a few hours. We had all trained to run 4 minutes/walk a minute which is exactly what we started to do once we got out of town. Another training strategy we had worked with was walking all the hills. 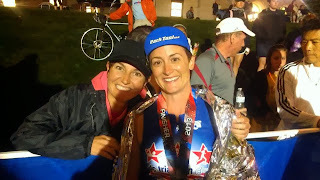 E felt great and I could tell that she was running faster than I was comfortable with. I tried to stay with her and not walk the hills in the beginning, but it was started to affect my confidence. I knew by mile 3 that I was not going to be able to hang on to her the whole marathon. We saw a bunch of people we knew and it really helped our spirits. 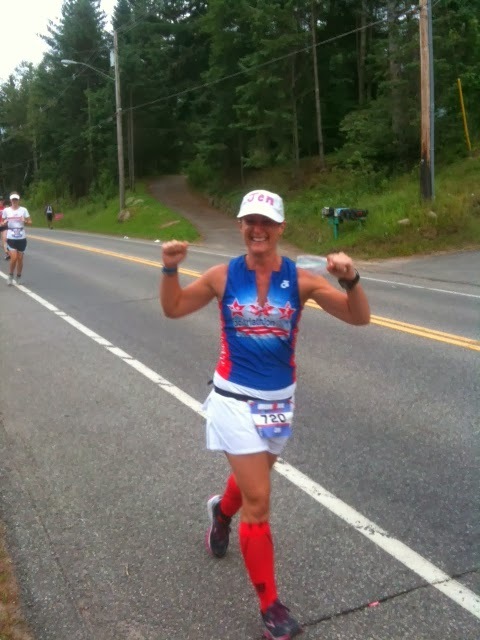 In fact, around mile 5 for us, and 9 for the boys, we saw TG and E's boyfriend, B. Wow. It felt like we were immediately lifted up. A HUGE boost for us. And more importantly, it made me feel good that they were together, conquering the course as a team. I kept with the 4/1 and walked all the hills and was feeling really good. But something happened at mile 11. It is very hard to put into words. Basically, I looked at my watch and saw that I had like 4 hours left. I started to weep. I was going to be an Ironman today. I WAS GOING TO BE AN IRONMAN TODAY. I was so excited and at peace. And I did something that I had no plans to do... and thinking back it makes zero sense to me. I walked. Practically the rest of the race. Literally walked 15 miles. I chatted with every one I passed, everyone that passed me. High-fived all of the kids because I was really missing mine. Thanked ALL of the volunteers. And I smiled. I was smiling from ear to ear. Everyone commented on my smile. I walked when I saw others that I knew. I walked when I got back to town and started my second loop. I walked. 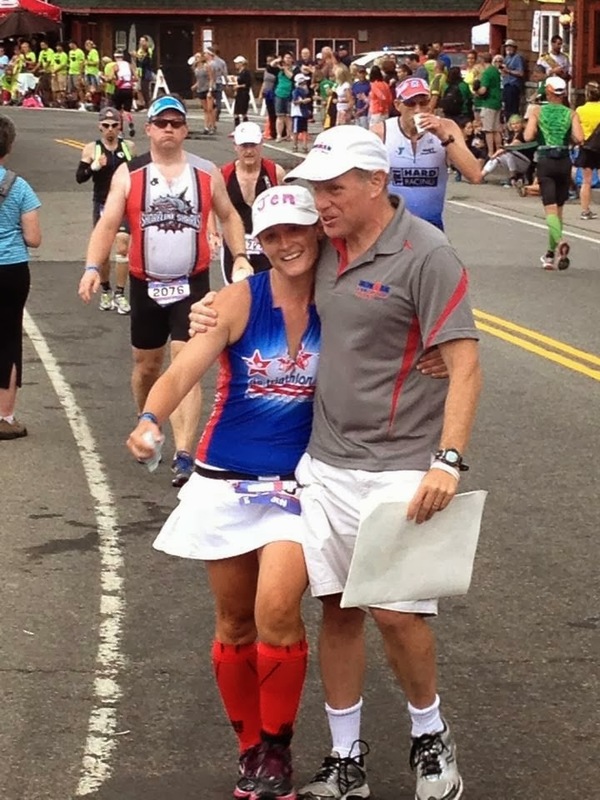 At mile 13, I went into my special needs bag and got the hat my mother had sent me to wear in honor of my brother, Kenny, who had passed away a few minutes after he completed his first HIM. It made me cry again. I did run this part a little. I think having Kenny's hat on, made me feel like he was with me. I knew that Kenny would be proud of me. I also ran a few down hills because well, running down hill is just fun. Andy, the man who convinced me that I could do it. Heading back for the second loop was a little jolt to the spirit. I could hear people finishing and I had to go back out. I was doing a lot of walking here. I did see my teammates. It was a nice boost. I felt fine but something just told me to walk. I walked fast, but rarely ran. Around mile 16, I started to get cold. I saw an older lady handing out some thermal blankets to the people heading back into town. I crossed the street and asked if I could have one. She gladly handed me one. About a mile later, it started to rain and I was so glad to have the warmth of the blanket. If I was running, the rain would have been a nice treat, but since I was walking and the sun was setting, it got cool. As I was heading back into town, about 3 from the finish line, I saw finishers walking their bikes back. This hurt my morale for a few, but then someone said: Look here comes an Ironman. It made me smile ever bigger. I knew I was going to make it. I knew I would have plenty of time to spare. Let me just tell you the last mile, the crowds and music was AMAZING. I felt so pumped. With less than a mile left, I started to jog. My body felt good. I wasn't sore or tight. I got to the finishers shoot and was overcome with emotions. I was going to be an IRONMAN. I was so overcome, I never heard Mike Reilly say: Jen Green You ARE and Ironman. My friends said they heard it. I crossed the finish line and was so elated. Even better: the gang was all there to see me finish. Waited for me, the last one, to cross the line. It was humbling for them to do that. Everyone here but C who wasn't feeling 100% and D who I would find out was at the hospital. 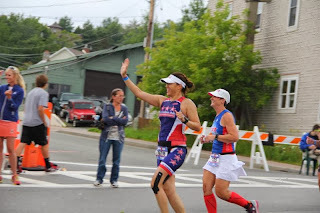 And then, an even more humbling moment was to see my GBA runner friend whose only purpose to be in Lake Placid was to see me finish - to be there so I wouldn't have to be alone at the finish line. I will NEVER forget her selfless act (and the good Doctor's) and I will without a doubt be there for her IM finish. My goal was to finish. I thought for sure I would barely make the 17 hour mark. I am happy with my time. I had zero heart issues the entire race and for that I know I am blessed. This was an amazing experience. I want to do it again. I WILL do it again. I want to see just how well I can do if I did push it more. The hard part is over, I know I can finish.... now I want to see how fast I can finish, safely. For those reading who think they could never been an Ironman. Believe me, if you want to, you can. I had only been riding my bike for 2 years. I trained using the Be IronFit book. I started in January and raced in July. If you commit to the workouts, you will finish. That was a great race report! The emotion in the IM is incredible! Congratulation Ironmom!!!!!! !